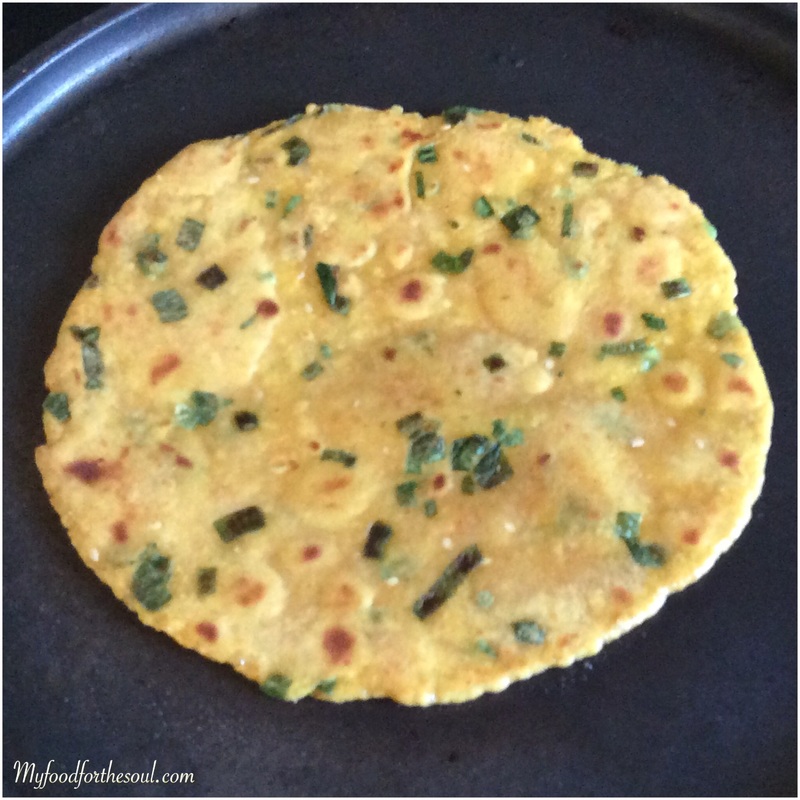 Dhebra, Thepla or savory flavored Indian Flat Bread all have one thing in common that they’re absolutely delicious and super simple to make. Green Spring Onion Dhebra also known as Thelpa, it’s a superb breakfast or an afternoon tea time snack. This dish is a combination of whole wheat flour, freshly chopped green spring onion, yogurt, sesame seeds, salt, sugar and seasoned with some dry spices all kneaded into a nice soft dough. Then rolled out into a round circle and cooked on a flat fry pan spear with some oil and served with a dollop of makhan (butter). Dhebra is one of my personal all time favorite breakfast, I love to make a large batch of Dhebra and keep it stored in my stainless steel container (dhaba) to enjoy it with my morning tea (chai). It’s also a great snack idea for the little ones. 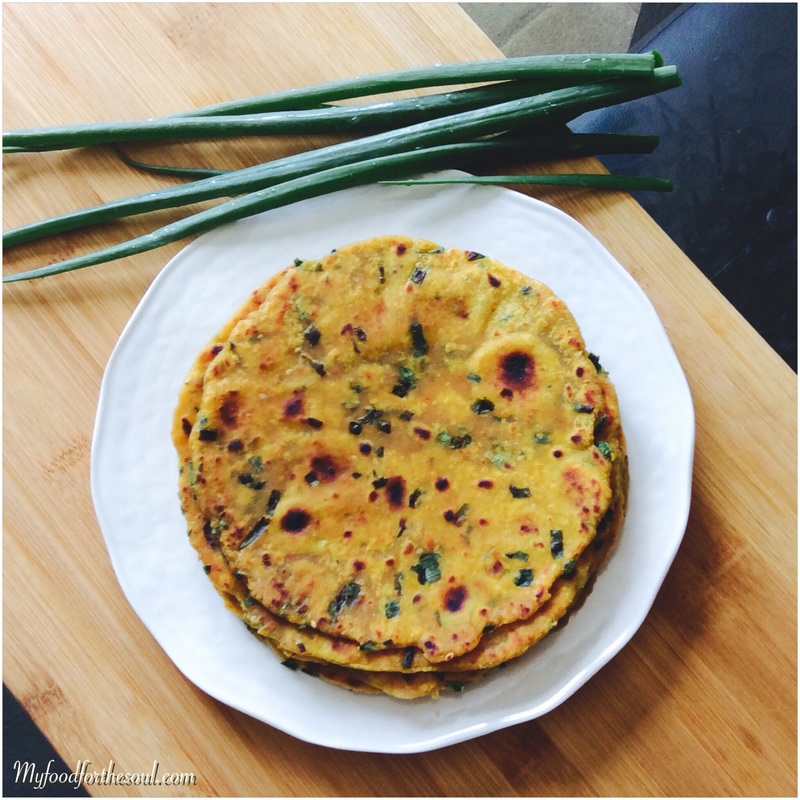 My kids enjoy these green spring onion Dhebra with their favorite flavored yogurt. The fresh green spring onions also known as scallions used in my recipe were right from my ow garden. This year we’ve planted many different kinds of onions in our garden, but onions do take their time to grow to the full form. So in the meantime, why let the greens go to waste I decided to make fresh dhebras for the family. Green onions are very flavorful and tasty when add to any dish they help enhance the flavor and look. This is a great go to food and an all time favorite in my house. 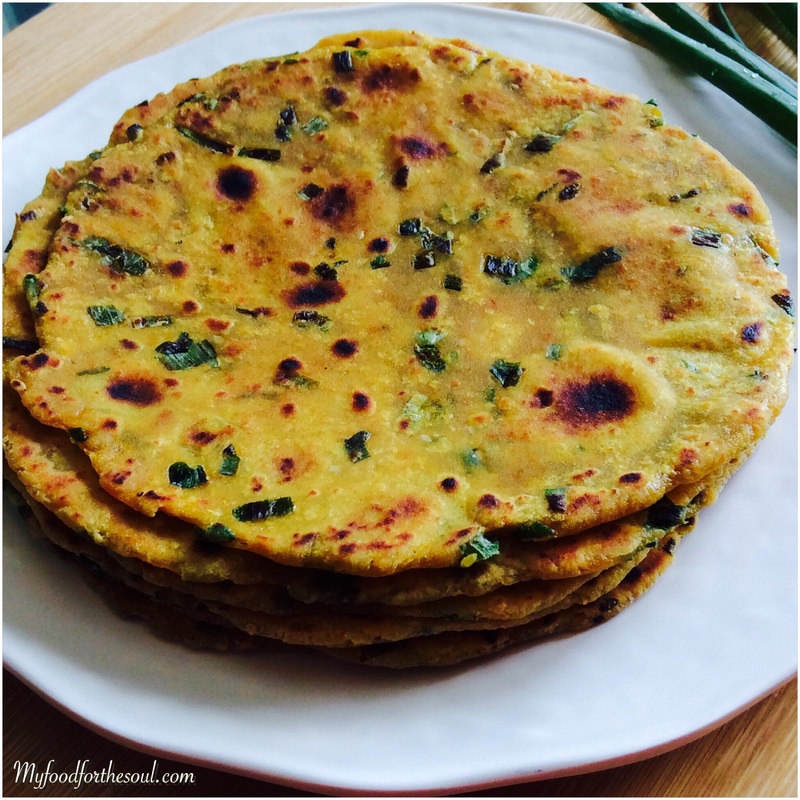 Dhebra (Thepla) can be made in many different versions. 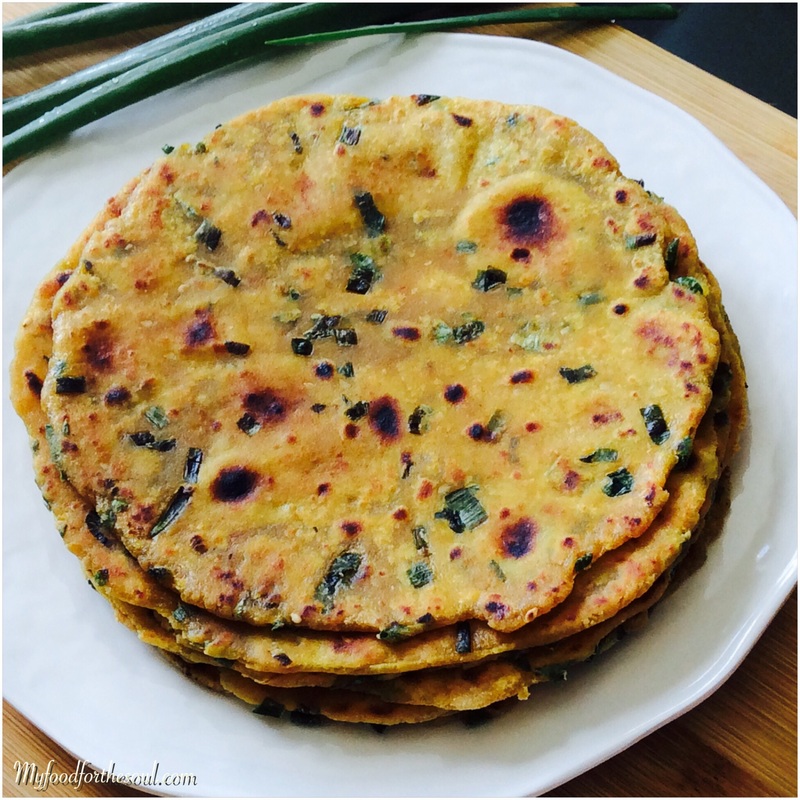 Be sure to check out Methi Palak Thepla which is another great breakfast or snack idea and also great to pack in the lunchbox. Into a bowl add in all of the ingredients (except the oil for frying) wheat flour, red chili powder, turmeric powder, garlic powder, sesame seed, sugar, yogurt, green spring onions,salt and oil. (I use my Kitchen Aid Stand Mixer bowl, but this can be done in a regular large bowl). Mix all ingredients until incorporated into the flour. Add little water at a time and knead into semi soft dough once done apply a little oil to the palm of your hands and spread all over the dough. **It should not be too hard or too soft and sticky**. Cover it and keep it aside for only 10 minutes. After, 10 mins knead the dough once more and divided the dough into approx. 12-13 tennis size balls and flatten them in between your palms. Once Tawa is hot place rolled dhebra on it and let it cook for 30-40 seconds or till you see a few bubbles on the top. With the help of spatula flip it. Drizzle some oil and spread it evenly on it and let it cook for 30-40 seconds. Flip the dhebra again. Press it lightly with spatula starting at the edges then into the center. Also apply some more oil on top side and flip and cook again by pressing. Cook till both sides are properly cooked. Once both sides are cooked, remove dhebra onto a plate *** place paper towel on the bottom of the plate so it will absorb the water from the steam and avoid the dhebra from getting soggy. Repeat the process with the rest of the flatten dhebras balls. Serve hot with your choice of plain yogurt or achar (pickle). Make sure the tawa is not smoking hot, this will burn the theplas. Let dhebra completely cool down before storing. Store in air tight container and keep at room temperature. Shelf life of dhebra is about 5-6 days. When shallow frying the dhebra, it will get really smoky so it’s best to either turn on the exhaust fan or open up your windows. The house will start to smell oily.